Now Jiang people had nothing to do but let Jiang Yun and Feng WuJi have a duel. Though they were worried about Jiang Yun, they could not break the rule of the Mang Mountains. However, they were kind of relieved when they found Jiang WanLi said nothing all the time, with a calm look. Because Jiang Yun was a mortal. He was busy learning medicinal herbs and refining Dan medicine. He never had a fight against others. While his playmates never asked him for a martial competition because they didn’t tend to hurt his self-esteem. As a result, none of Jiang people except Jiang WanLi knew how powerful Jiang Yun could be. Jiang WanLi was the one who knew Jiang Yun best. Hence, his calm face showed that he had confidence in Jiang Yun. However, though they were kind of relieved, they still couldn’t believe that Jiang Yun was strong enough to fight against Feng WuJi who was already in the fifth level of Meridians Unclogged Realm. “Ha ha, folks step aside! It’s WuJi’s showtime!” Feng Ling laughed. He had other Feng people back several meters to give the duel enough space. While Jiang people came forward instead, standing right behind Jiang Yun. Even if Jiang Yun might lose this battle, they would support him with their own actions. Now Feng WuJi and Jiang Yun stood face to face with a distance of around six meters. Feng WuJi looked at Jiang Yun contemptuously. Since he had become an inner disciple of the Samsara Sect, the whole One Hundred Thousand Mang Mountains had meant nothing to him, not to mention Jiang village or this mortal person Jiang Yun. What Feng WuJi said caused discontent among Jiang people. Because people in the fifth level of the Meridians Unclogged Realm were able to control the Spiritual Gases and release them. They could even cast magic arts, like the Wind Blade Feng WuJi had cast to attack Jiang Yun before. And controlling the Spiritual Gases with one hand or two didn’t make too many differences. With a loud sound, a whirlwind blew over Feng WuJi’s body, blowing his long hair up highly. His eyes were like burning flames. Apparently, he was enraged at Jiang Yun’s words. Angrily, Feng WuJi acted first! He raised his right hand and grabbed into the sky. Then a whirlwind was condensed into a sharp blade from his hand and shot towards Jiang Yun quickly. He just did such a sneak attack on Jiang Yun before, and now he attacked Jiang Yun in the same way. Last time it was Jiang Mu who helped Jiang Yun to defend against the attack. However, he would like to see how Jiang Yun himself could face this attack this time. This Wind Blade was though quite slower than the previous one, the strength it contained was much stronger. When it flew fast across the sky, it brought about a puff of airwaves. Apparently, Feng WuJi did this on purpose, through which he put pressure on Jiang Yun. While at this moment, everyone found Jiang Yun who should have stood over there disappeared within a blink of time. Then another second passed, and Feng WuJi suddenly felt something pressed his throat. He found Jiang Yun show up as a ghost. Meanwhile, Jiang Yun’s forefinger was right at his throat! Losing its target, the Wind Blade exploded in the sky. Follow that was dead silence! No one had imagined that Jiang Yun had such a quick speed. He not only could fend off the attack of the Wind Blade, but could also reach Feng WuJi from a distance of six meters in a flash. If it was Feng WuJi who showed such quick action, nobody would be surprised. After all, he was a cultivator. He could easily make use of the Spiritual Gases to improve speed. Whereas, Jiang Yun had no Spiritual Gas in his body. It was incredible to reach such speed only due to one’s good physique. Although Feng WuJi was unscathed, the result of this martial competition was clear. What if the thing pressed his throat was not Jiang Yun’s finger but a sharp knife? If Jiang Yun gave it a little harder push, he would easily pierce Feng WuJi’s throat. Feng WuJi would definitely die. Under the gaze of all the people, Jiang Yun put his finger down and took a few steps back, then said calmly. “You!” Feng WuJi recovered after several seconds. he held his voice back after saying a word. Though he really wanted to shout abuse, he couldn’t even find a reason to open his mouth. Jiang Yun’s victory was tricky to some extent. however, his underestimation of Jiang Yun was a more important reason. Feng WuJi became fierce. He gave a loud shout, with a hurricane appearing over his body, and raised his hands. Then four Wind Blades rushed towards Jiang Yun in speed far quicker than the lightning, forming a sort of circle around him! Feng WuJi could never face the fact that he as the fifth level of Meridians Unclogged Realm was defeated by a mortal who couldn’t cultivate. Ashamed into anger, he had totally forgotten his promise that he would only use one hand. Now all he wanted was to defeat Jiang Yun and even kill him to wash off disgrace. No one had ever thought that Feng WuJi would attack Jiang Yun after he had lost the martial competition. Such behavior was extremely taboo. Moreover, according to Mang Mountains’ rules, people in a duel could hurt each other hard but absolutely no killing, unless it was a “Life or death’ battle. Thus, what Feng WuJi had done totally broke out Mang Mountains’ rules. Now the distance between Jiang Yun and Feng WuJi was much shorter. Within such a short and narrow scope, it would be impossible for Jiang Yun to act as fast as these four Wind Blades. Jiang Mu shouted at once. He made only his tiptoes touched the ground and was about to rush over to Jiang Yun. While a hand appeared in front of his body like a barrier blocking all his actions. “Uncle Jiang?” Looking at Jiang WanLi, Jiang Mu was stunned. He was quite confused that why Jiang WanLi didn’t allow him to save Jiang Yun immediately. But then he understood. All the people understood. They saw that Jiang Yun completely ignored those four Wind Blades surrounded him without any gap; instead, he stared at Feng WuJi unblinkingly and took steps towards him. The four Wind Blades hit Jiang Yun hardly, making a series of explosions, which caused a small tornado to form after exploding together, blowing stones everywhere. While Jiang Yun went out from the tornado. He came in front of Feng WuJi within just one step and pressed Feng WuJi’s throat again. However, this time it was not his finger but a dagger emitting cold light! 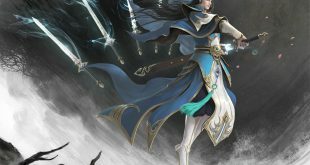 If Jiang Yun’s first triumph seemed to be a coincidence and good fortune, then this time his triumph of this battle in which he made his body meet and resist the Wind Blade directly proved that his real power was as strong as that of Feng WuJi. Moreover, on Jiang Yun’s body where were hit by the Wind Blade, four light marks were displayed, surprising everyone again, except Jiang WanLi whose eyes still squinted but a small glow of satisfaction came out from his eyes. Though Jiang Yun was not a cultivator and he never fought against others before, he was experienced in fighting. Even Jiang people had no idea that since Jiang Yun was six years old, every time when he went into the deep Mang Mountains with Jiang WanLi and every time when they met fierce beasts, Jiang WanLi would gradually reduce helping him to fight against those beasts. After Jiang Yun was ten, Jiang WanLi hardly gave a hand to him. It could be known that how countless battles he had had with fierce beasts during these ten years! Furthermore, Jiang WanLi had found that when Jiang Yun fought against fierce beasts, he would imitate some features of them automatically to improve his fighting skills since he was ten. This in addition to the medicated bath over these years gave Jiang Yun a quick speed and a strong body. All of these led to his triumph of challenging a cultivator as a mortal!